Well done to Phil Mickelson for winning the Open Championship on a challenging day at Muirfield. The course was tough, but fair and as the day wore on, many opportunities presented themselves to the leaders. Many could not capitalize. Mickelson, however, did, and took the Claret Cup with strokes to spare. By the time he had sunk his birdie putt on the 18th, only a miracle to another player still on the course would have denied him his victory. Well done, also to the rest of the players in the field, who individually gave outstanding performances during the tournament. When my wife and I were at Muirfield in 2002, the scene was quite different as there was a 4-way tie at the end and no clear winner until Ernie Els parred the 18th to secure his win in sudden death. This year it was different, as it was clear who the winner was with players still out on the course. But the excitement level was the same, and the crowd, always knowledgeable, gave enthusiastic recognition to to the outstanding level of play witnessed during the day. After the excitement of the finish and as the crowds head home, it is always nice to sit back a bit and savor the feeling of the golf course as it slowly reverts to its natural self. Even though the grandstands, the tented village, the various support facilities will not be dismantled until the following day, there is a feeling of peace and quiet as the sun begins to dip in the west. The tee boxes are cleared, the fairways are now quiet and the flags have been removed from the greens. There may be watering here or there, but serenity is in the air. It seems so sudden, after a week of intense activity. But soon the course will be active again, as members and guests hit the links again for a round of golf. The par 3 16th hole gave many of the players a great deal of trouble. I think it was a pivotal hole during the championship. So much could go wrong even with a tiny error. In many cases escaping with a bogey was a good result, and indeed, Lee Westwood, during the 3rd round, saved a crucial bogey after landing in severe trouble on his tee shot. On Sunday, however, once Mickelson was finished at the 18th with a score of 3-under par for the championship, the closest player, Westwood, was at 16 and needed three birdies starting at the 16th to catch him or birdie-eagle-birdie to win. That was an impossibility, given how the holes were playing during the tournament. 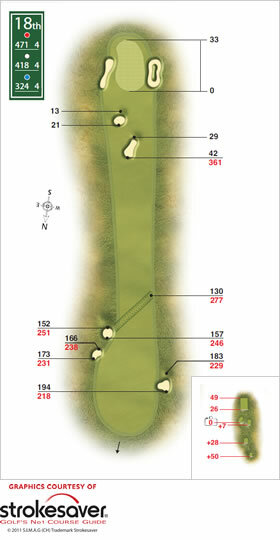 Below are the yardage charts of the 16th, 17th and 18th. A poor tee shot at 16 could almost guarantee bogey. 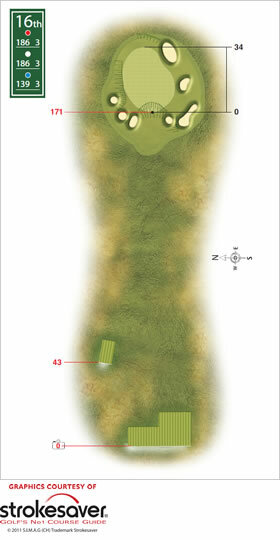 At the 17th, the decision is whether to take on the cross bunkers on the second shot to try and get on the green in two. 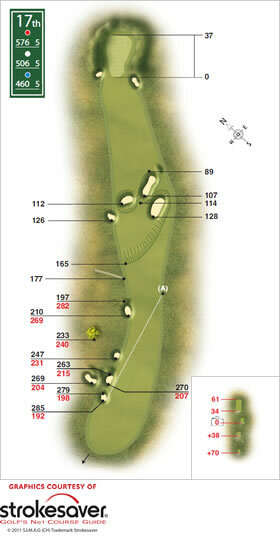 The wind, also, plays a factor, and a head wind would make that shot extremely risky. On 18, the key is a good tee shot and to avoid the bunkers. Mickelson played these three holes par-birdie-birdie. Westwood, on the other hand, hit a poor tee shot at 16 and made bogey. Now needing an eagle at 17, he went for it with driver on his second shot and ended up in the deep right rough, denying him any shot at an eagle and thereby securing Mickelson’s victory. All in all, this was a great tournament and we are looking forward to next year, and of course 2015 at St Andrews!